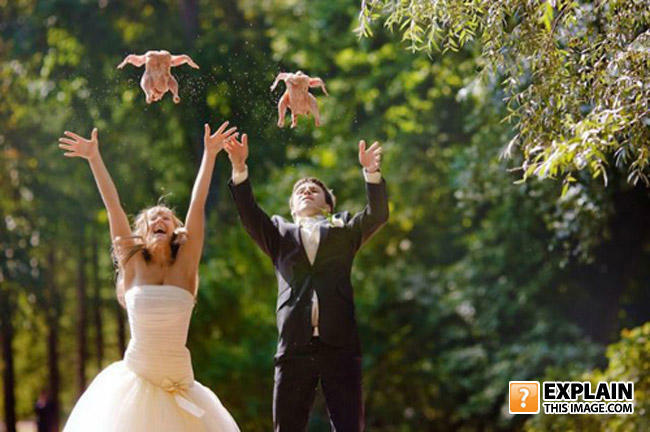 In a tradition only practiced among .00067% of the world's Jews, rather than the groom smashing a glass with his foot, the bride and groom launch dead chickens in the air, representative of the new couple's relationship taking flight. Oddly enough, the divorce rate among the sect is at 87%. Elephants will fly before I marry him. Idiot, vegetarians don't eat chicken. Sonic Team/Capcom/Sega in a nutshell. Canadians.. What you gonna do? .. come back Peter, come back Paul. Ohh PETA PETA PETA how low can you go. Does it really need an explanation?